Charles C. Sanders was one of the 7 children of Francis T. and Zella Walker Sanders. He and his twin brother, Clifford, were born in Nebraska on December 18, 1918. After attending college in Nebraska Charles moved to Washington about 1939 and worked as a welder. He was a decorated Marine veteran of World War II. His military training was as a military Policeman and he served in Iwo Jima. He was hired by the Oregon State Police on March 1, 1948. 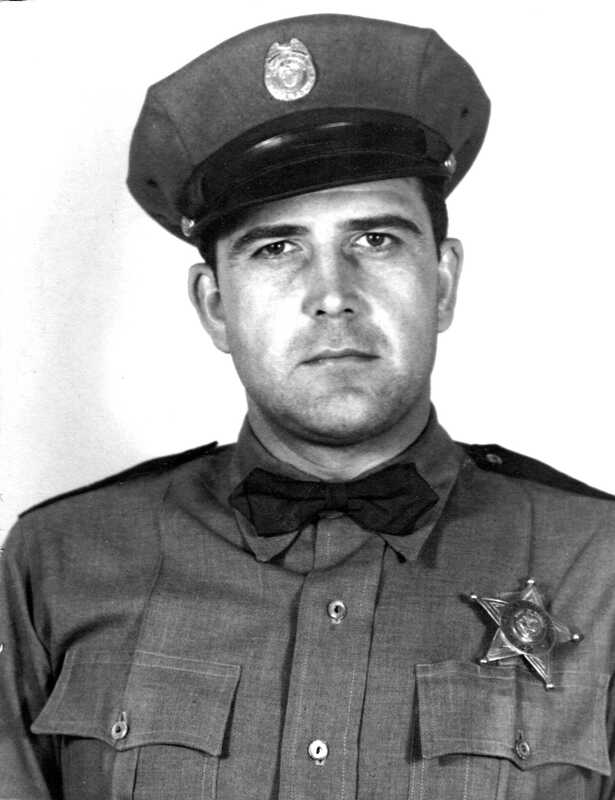 Thirty-nine year-old Trooper Charles C. Sanders, an eight-year veteran of the Oregon State Police stationed in Eugene, was involved in a gun battle in the River Road area of Eugene on February 22, 1957. He had responded to a radio call for assistance from a Lane County Deputy Sheriff E.J. Robertson. Deputy Robertson and Deputy David D. Hefner had gone to the Albert Wachsmuth residence on Park Avenue and were talking to Mrs. Wachsmuth. Apparently Deputy Heffner had previous encounters with Mr. Wachsmuth and Wachsmuth had threatened Heffner. While they were talking to Mrs. Wachsmuth Albert Wachsmuth shot Deputy Hefner in the neck. The call for assistance went out and Trooper Sanders arrived along with other local officers. The ensuing gun battle with the suspect, Albert Wachsmuth, lasted 2 hours. Sanders was fatally wounded by a rifle shot from inside the house when officers rushed the residence. The suspect ran out the back door and attempted to commit suicide, but survived the self-inflicted gunshot wound. Albert Wachsmuth was later charged with First Degree Murder. Deputy Hefner, shot in the neck, died of his injuries in July. His funeral and burial was attended by more than 500 state and local police officers at Rest-Haven Memorial Park in Eugene.